Comfortable work footwear isn't easy to find. That's why Chippewa works hard to develop practical men's boots, manufactured with the best materials and skilled craftsmanship. The Chippewa Men's 27868 USA-Made Black Motorcycle Work Boots are a perfect example of wha ... (see full details) (see specifications) #CHP27868. Comfortable work footwear isn't easy to find. That's why Chippewa works hard to develop practical men's boots, manufactured with the best materials and skilled craftsmanship. The Chippewa Men's 27868 USA-Made Black Motorcycle Work Boots are a perfect example of what the brand has to offer. The rugged uppers are made with black odessa leather that's abrasion-resistant and strong. The black leather exteriors are easy to maintain and quick to break in, so that you can start enjoying a great fit soon after you put on the Chippewa boots. The soft leather lining on the inside feels great against your feet. Texon footbeds cradle your feet and wick away the moisture that tends to collect. Your feet stay cool, dry, and comfortable in this well-designed environment. At the very bottoms of these USA-made footwear is Vibram rubber. These high performing Vibram Mini Lug Yellow Plug outsoles are built to absorb shock so your feet don't have to. You'll feel the difference this can make with every step you take. Oil- and slip-resistant, these durable soles will increase your lateral stability. Excellent traction adds to the package to keep you steady on your feet and in control. Chrome, non-tarnishable rings look great on the exteriors, but it isn't all about the hardware. For more stability, there are triple-ribbed steel shanks in place that you can rely on daily. 4 iron rubber/6 iron robus midsoles create a solid foundation for you, so go ahead and start your adventures in these American-made boots. To firmly secure the rubber outsoles to the rest of the black boots, Chippewa uses Goodyear Welt construction. This method uses heavy-duty waxed threads and durable Welts to create a sturdy attachment. To extend the life of the product even more, the Goodyear process is repairable. This is something you may just have to experience to really appreciate. 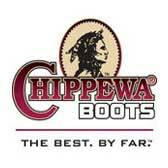 So order your pair of Chippewa Men's 27868 Black Motorcycle Leather Boots from the Working Person's Store today. Just received my boots. I read from the other customers the boots run about half size larger. They were correct. I usually wear a size 11 but I bought a 10 1/2 and fits like a glove. The boot is the most comfortable bar none. I just wore out a pair of Frye after five years. Had to have special insoles when wearing the Frye. The Chippewa I can wear just as purchased. As for Working Persons Store customer service I was impressed. There was a hick up on my credit card and shipping. Upon calling they corrected the error and had my boots at my front door in two days. That's good business. I love these boots so much that I bought them in both black and brown. They are comfortable, look great, and the best thing is they are leather lined, so they stand up on their own. Also, I cannot say enough about the great service from Working Person--they were very helpful and I got my boots sooner than I had expected. Great company to deal with! Just got my boots a few weeks ago. Fit is great, but make sure you order 1/2 size smaller, they run big. These boots are USA made, what more to say. I love these boots. Working Person store customer service is 2nd to none. I have had a pair of these for eight years. Best boots on the market for the money! I just ordered a new pair to wear when I ride my new Roadstar. I ordered these boots to Thailand. Very great boots. I order 1/2 size down. Look great with jeans and my uniform. Chippewa Boots: Men's USA-Made 27868 Black Motorcycle Boots is being added to your cart.